Cork native John Murray joined Cashel Community School as a music teacher when it opened its doors in 1994. Over his 22 years in Cashel he has taught music to countless numbers of students and inspired both a love of music and creativity in them. 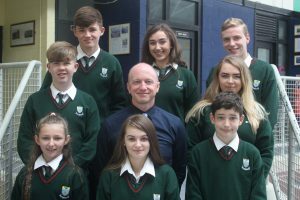 John’s commitment and dedication to his students and to Cashel Community School has been extraordinary and the countless hours of additional time that he has put it is recognised by students, parents, staff and management. He is renowned for the annual musicals that he directed and produced and his contribution to the musical life of Cashel Community School has been unquantifiable. His choirs have won many competitions and travelled to perform in New York at commemoration events for 1916 as well as singing for Queen Elizabeth on the Rock of Cashel, RTÉ Sunday Mass on two occasions and in Dáil Éireann. They have also performed at many community events and celebrations. His pride in his students is easy to see by all. John is widely respected in the community and was the popular recipient of the Lions Club Cashel Person of the Year 2017 for his musical contribution to Cashel and surrounding areas and for initiating a very fitting tribute showcase to the events of 1916. John is Chairperson of the Board of Directors of Cashel Arts Festival and is involved in many other community organisations. He is married to music teacher Helen Colbert and his two daughters Johanna and Rose are former students in Cashel Community School, both of whom are talented musicians in their own right. We congratulate John on his appointment as Deputy Principal of Cashel Community School and wish him every success in his new role. We know that he will relish both the challenges and opportunities of his new role and will serve to enhance the quality of life in Cashel Community School. Back Row (left to right): Stephen Browne, Aoife White, Lorcan Reade. Front Row (left to right): Éire Morrissey, Caitlin Morrissey, Evan Hennessey.